The study of the Universal Laws of Nature, of Light, Color and Darkness, in relationship to painting therapy, has its foundation in the work of Johann Wolfgang von Goethe (1749 – 1832), German Scientist, Geologist and Poet, and Dr. Rudolf Steiner (1861 – 1925), Austrian Scientist, Educator and Philosopher. Steiner founds a philosophical movement called Anthroposophy, which literally means wisdom of the human being. 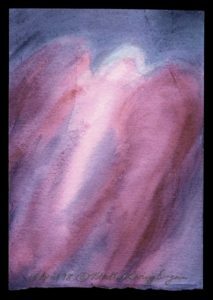 We have to thank Ita Wegman (1876 – 1943), a Dutch woman and the first Anthroposophical Doctor, and Liane Collot d’Herbois (1907-1999), a Scottish/French Artist, for developing this method of painting therapy. Collot d’Herbois, who begins painting at age 16 and paints until nearly 92, has the seed ideas for this method when she is 25. Wegman and Collot d’Herbois further develop painting therapy between 1927 and 1943, until Wegman’s death. Over the years many people came to Collot d’Herbois, and went with her influences. With each person she gave specific exercises, sometimes artistically oriented and sometimes therapeutically integrated. So there does exist a myriad of Collot d’Herbois exercises, each with a different slant or influence given by different people. Within the laws, one must penetrate the work and make it their own. These exercises reside with teachers/therapists or students of teachers in different countries, mostly in the USA and Europe. Though there isn’t a place or person or compilation of all the exercises put together anywhere, YET, much is being done to further the work in the artistic realm with several artists teaching Collot d’Herbois’ artistic methods in veil painting around the world. There is one school furthering the therapeutic work of Collot d’Herbois, the Emerald Foundation in Den Haag, The Netherlands, which is recognized by the Dutch Society for Art Therapy and the Medical Section, First Class of the School of Spiritual Science, Goetheanum in Dornach, Switzerland. This method of painting therapy is based on the Universal Laws of Light and Darkness as we see in Nature. For example, our major light source is the Sun – UP there in the sky. The Light is so strong at its source that we will go blind if we look at it. When clouds come in front of the Sun, we see rays of light, and they are always linear and straight. Light can reflect and refract, though cannot bend and go around corners. These are Universal Laws of the Light no matter what language, culture, or place we live on the Earth. There are Laws of the Darkness as well. Darkness is not evil. Darkness is goodness, love, mercy, wholeness – the Divine Feminine principle. Whereas Light is the Divine Masculine principle. Evil is evil. In Collot Painting Therapy we are helping the patient/client to create a COLOR SPACE based on these laws of Light and Darkness.